#26 24th Sep 2008 at 12:08 AM Last edited by XTS : 24th Sep 2008 at 12:38 AM. Wow, you cleaned up the thread. Looks nice. Hope the link is the same. I'd better check it. Does the current release include the bohemian fix? I noticed the time of the update on the thread is after the fix upload.. So I'm thinking maybe yes. I just got the update. Was thinking maybe the teddy MESH issue was associated with me having the april download to begin with.. an older version. EDIT: Link works perfectly. Awesome I don't have to change it each time a new EP comes out. You rock! thank you very much, great job as allways. I have a question! First off I would like to say a HUGE "Thank You" to Numenor for updating the CEP!! You are the greatest!! Now, do I need to un-install the old CEP before I install the new one, or does this one just update the one I already have? Thanks in advance for you're help!! tho just windering is the new food stand on your list items to be made recolorable? Thank you, thank you, thank you. Now maybe I'll have properly working phones and stuff! #31 24th Sep 2008 at 4:09 PM Last edited by Numenor : 24th Sep 2008 at 9:02 PM. Havelock - Thanks for the fix; I worked on this yesterday night but I couldn't manage to finish it (among the various possibilities, I even though of creating a brand new object as repository: a small connection for the outer corners...). Maybe I can at least find a solution to make the placement of the diagonal pieces easier. XTS - Keeping the thread clean without changing the URL it's my job In any case, the alias "http://cep.modthesims2.com" should always work, even if I'd have to change the actual URL (which will never happen, anyway). Rhondacathey - The new installation automatically uninstall the previous versions. Knighguy - Almost all the AL objects are still missing, and are on my to-do list. At the moment (I'm at work) I don't remember if the food stands can support recolours or not (I'm positive anyway: they shouldn' be different from the BV ones). Take care and thank you again! You still rock! *raises hand* Question! With the latest version of CEP, are ice rinks and roller rinks now recolorable? I seem to reall reading a thread a few months ago where you mentioned that. All the 4 rinks (ice and roller, small and large) have been made recolourable when Seasons came out (CEP6, if I remember well). I hope that they still are recolorable Try recolouring them, and if there are problems, let me know. YAY! Thanks for this Numenor! Hurrah! I works for me too! Hmm, it seems that I'm only able to recolor the railings of the ice/roller rinks. I wanted to see if I could make up some scuffed up surfaces. #40 26th Sep 2008 at 11:19 AM Last edited by Numenor : 28th Sep 2008 at 9:31 AM. Starfish of Terror - Then, your first question was lacking an important element You already knew that the rinks were recolourable, though not fully. Thank you so much, Numenor! CEP is great and I can't thank you enough for all the effort you put into this. Whoops, sorry for not being more specific. I only asked because I remembered you saying in this thread that you were going to make the floors of the rinks recolorable with the latest CEP update. Thanks for the update Numenor! I'm wondering if when you do the next update if you could make a second recolorable subset for the FT cribs/changing table (make the wood one subset & the fabric another?) and do the same thing for the couch that came with IKEA with the little heart on it. It makes no sense that the couch with the pillow on it lets you recolor the couch & the pillow, but the heart one doesn't. If you've got too much on your plate, don't worry about it, I just thought it'd be cool. I'd do it myself, but am clueless in this area. Thanks again for all your hard work! #47 28th Sep 2008 at 3:11 PM Last edited by Lord Darcy : 13th Oct 2008 at 11:23 PM. Thanks for including the Club Commercial Counter fix in CEP-Extra. 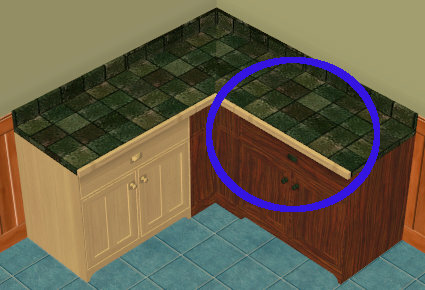 I realized that the Club Kitchen Counters and Club Island suffer from similar problem - this time, the front trim of countertop. You cannot freely mix and match without losing the seamless look like the left one. Can it be fixed in a similar way as commercial counter by CEP-Extra? Is the Simply Round double height column disappeared due to AL or this newer version of CEP? Hoping it can be brought back!!! #49 28th Sep 2008 at 9:12 PM Last edited by simsample : 2nd Oct 2008 at 11:44 PM. If you mean the OFB column, then that is part of the CEP Extra files. The column disappeared with later EPs and the CEP extra should reenable it. Check that you have the CEP Extra options installed. Numenor, I have found a little glitch to do with the _EnableColorOptionsGMND.package file. 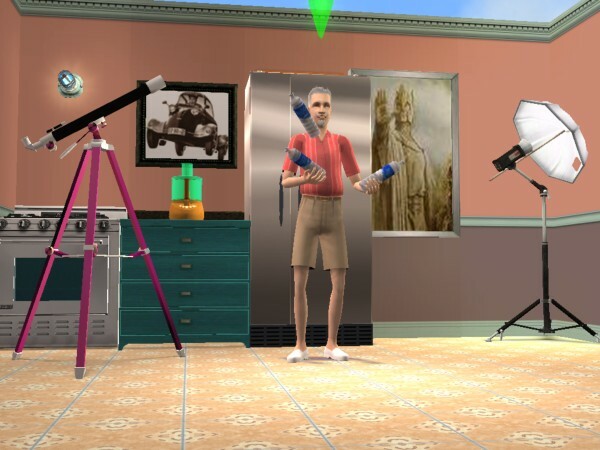 If this file is present in my Downloads folder then the Apartment Life stone building deco items take on a strange colouration. This was tested with no other custom content whatsoever; it makes no difference if the CEP extras are installed. This affects all of the 'Triumvirate' decor. #50 28th Sep 2008 at 11:49 PM Last edited by Lord Darcy : 29th Sep 2008 at 12:01 AM. Yep, this is the same issue that Havelock reported. @Havelock: Thanks for unlocking the Diagonal Cornice. I see that the diagonal piece has been properly textured. One question: Is "Diagonal Molded Belt" hidden somewhere? I'd love to have a matching piece for bottom molding. How stupid of EAxis to omit Diagonal pieces. If a room has even one diagonal wall, the whole set becomes effectively useless. I'd rather not use molding altogether than leave one spot uncovered. They really should have taken a page from this set.